Confident of winning Saturday's trust vote, BS Yeddyurappa on Friday evening said, of course, they are with us, if the MLAs from Congress & JDS don't support us, how can we prove majority? We will win the floor test 101%. The Supreme Court earlier in the day cut short 15-days time given to Yeddyurappa government to prove majority. Now the floor test will take place tomorrow. Confident of winning Saturday’s trust vote, BS Yeddyurappa on Friday evening said, of course, they are with us, if the MLAs from Congress & JDS don’t support us, how can we prove majority? We will win the floor test 101%. The Supreme Court earlier in the day cut short 15-days time given to Yeddyurappa government to prove majority to just one day. Now the floor test will take place tomorrow. 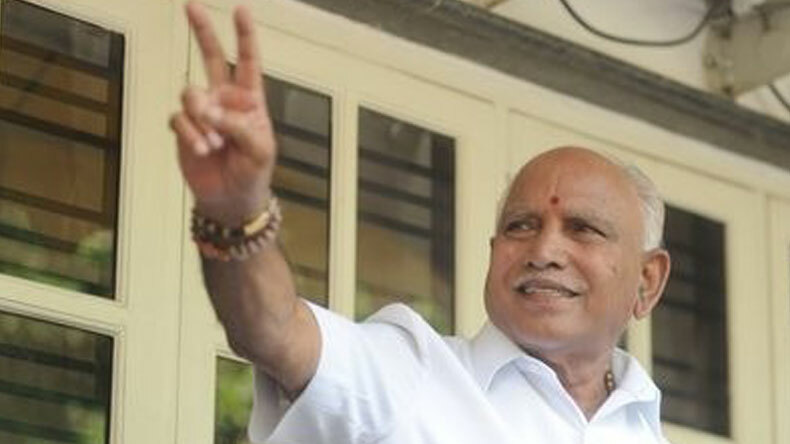 BJP Yeddyurappa has taken oath as Karnataka Chief Minister after Governor Vajubhai Valla invited BJP to form the government. However, challenging Governor’s order to allow BJP to form government and ignoring Congress-JDS alliance to form the government despite having the majority. Meanwhile, the Congress party has also said that mining baron Janardhana Reddy is trying to bribe their MLAs by offering money to support Yeddyurappa ahead of the floor test on Saturday. The Congress party has also released an audio tape alleging that Reddy was trying to lure the MLAs. “Congress released an Audio clip where BJP leader Janaradhana Reddy is trying to lure Congress MLA from Raichur Rural by offering money and posts. Janaradhana Reddy clearly says he has the backing of BJP President Amit Shah for doing horse trading,” Karnataka Congress said on its Twitter handle. However, hitting back at the Congress party’s allegation that Janardhana Reddy tried to buy their MLAs, Union Minister Prakash Javadekar on Friday said, “This audio CD is one of the handiworks of Congress’ dirty tricks department. This is a fake CD. Earlier in the day, Supreme Court bench comprising of Justices AK Sikri, A Bobde, and Ashok Bhushan heard Congress’ petition challenging the formation of the BJP government. After Supreme Court’s judgement, former Karnataka CM Siddaramaiah said, “Wholeheartedly welcome the Hon. Supreme Court’s order. It has restored our faith in the democratic process. We are confident of our majority and will emerge successful in tomorrow’s Floor Test.